Super Bowl XLVI is almost here, folks. The New York Giants will face off against the New England Patriots in Indianapolis, Indiana for the title of NFL champion. However, if American football isn’t your thing, there’s still a reason to be interested in the single largest American sporting event of all time. This year’s Super Bowl is all about staying connected over the web. Here are some fun facts that will surely tickle the whiskers of any technology geek. 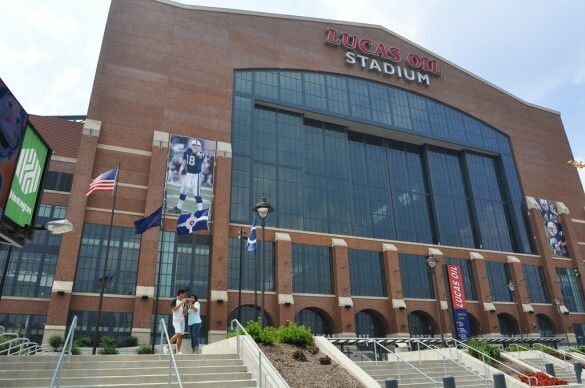 Lucas Oil Stadium, home of Super Bowl XLVI, will house around 85,000 spectators during the big game. There will be even more people in the surrounding area. To handle the inevitable high demand of cellular data traffic, Verizon will be setting up three cell-on-wheels (COWs), as they’re called, in extremely high-demand areas around the stadium. There will also be 400 3G and 4G LTE antennas spread out throughout the inside of the stadium, as well as 600 free WiFi hotspots that can handle 28,000 simultaneous connections. All of this is expected to handle 2.5 times the traffic of a normal NFL game. This is the first Super Bowl that will have 4G LTE connectivity in the area, so Lucas Oil Stadium, as well as 30 other downtown venues will be packing the latest 4G LTE antennas and technology. The cost of all this? A cool $69 million. The best part is, all of the upgrades made to the stadium and downtown will be left in place (except the COWs). So, the next time you’re in Indy, expect to get crazy fast speeds. 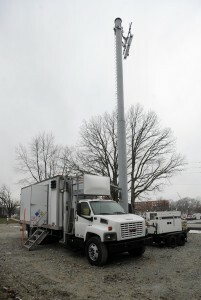 There’s no estimate as to exactly how fast the 4G LTE will be for spectators during the Super Bowl, but GottaBeMobile.com was able to sneak inside the stadium before gameday and run a few speed tests. They ended up hitting 46 Mb/s download speeds. Not too shabby, but they were one of the only ones using it at the time, so don’t expect to get that kind of speed come Super Bowl Sunday. Super Bowl XLVI will include the first ever social media command center used at a Super Bowl. A team of reps will be on hand to help you out via social media if you need it. They’ll be constantly looking for certain words or phrases that pertain to the Super Bowl. For example, if you tweet that the parking garage by the stadium is full, they’ll tweet back to you saying where more parking can be found based on other tweets. The social media command center will also be used to send out alerts if there would be any kind of emergency. Create a viral video that gets viewed by millions of people. Create a YouTube channel that drives traffic to your brand over time. Viral videos rely a lot on quirkiness and luck. Despite that randomness, there are some best practices that will help your video. The more methodical approach to building a popular YouTube channel requires a mastery of a wide range of online video best practices. The YouTube Creator Playbook is a guide to those best practices broken into Programming and Producing, Publishing and Optimization, and Community and Social Media. Tent Pole Programming: Schedule online videos in connection with cultural events to create more interest in your channel. The First 15 Seconds:How to hook your viewers by making the beginnings more compelling. Thumbnail Optimization:Create thumbnail images that act as mini-movie posters for your online video. Social Media: Using social media to find audiences for your YouTube channel. This is a very practical guide. Each best practice is introduced by a summary page that gives an estimate of how much time is required, description of what metrics are affected, estimate of how much the task will impact metrics and at what stage of production it will be used. The information helps content creators decide what is important for them to do. The how-to part is rich in detail and ideas on how to implement each best practice. The Playbook is a must read for anyone – beginner or pro – who wants to create and sustain an audience for online video. It can be browsed quickly for ideas and is strong on detail that explains how to implement practices. YouTube promises to keep updating the Playbook for more tips as they learn what works. There isn’t a subscribe option but keep an eye on the YouTube Creators blog. Again, the Playbook is a must read. The advice is collected and presented in a very useful way.